“Hmm?” Janine Pike didn’t want to open her eyes. The buttery smooth voice could have been conjured out of the decadent dream she’d been having. Something involving champagne, of course. Silk lingerie. Candlelight. Chocolate. A Hemsworth giving her a foot massage. “Signorina.” The voice was insistent now. She shaded her eyes, cracked one open just a slit, and instantly regretted it. Apparently she’d had a lot more limoncello to drink last night than she’d thought. “What is it?” she asked. Her voice trailed off as she took in the scene around her. Plastic cups and empty bottles littered the sand near the ashes of a makeshift fire pit. A silver hoop earring glinted, half-buried, beneath an abandoned hot pink bikini top. Not hers—Simone’s. But Simone, her boyfriend Christophe, and their gaggle of hot young European friends Janine had been partying with last night on the beach were nowhere to be seen. Neither was the boat. Or, to her horror, her backpack containing her entire wardrobe, her European journals, and her passport. Panicked, she scrabbled in her pocket for her phone and came up with only a crumpled €20 note and some lint. Oh, God. Her phone. Sometime last night she’d gotten up to charge it and—yep. It was probably exactly where she left it, plugged into one of the outlets in the galley of Christophe’s cruiser, which was God-knows-where in the iridescent waters off the Amalfi Coast by now. À Bientôt, indeed. So Long, sucker. “This is not happening,” she murmured, trying to quell her rising panic. She’d been in Europe for three months. Three months with no huge problems. When she’d stepped on the plane at Hartsfield International airport in Atlanta back in April, her mother had hugged her tight and made her swear to be cautious, to be safe, to come back in one piece. And Janine had promised. Up until now, it had been an easy promise to keep. “What?” she barked, hating the panicky sound in her voice. This wasn’t her. She gulped. There’d been a lot of drinking last night. More than the pile of bottles here indicated. Definitely more than twenty euros’ worth, that’s for sure. “My friend left his credit card with the bartender,” she explained, pointing toward the marina’s upscale rooftop bar. Damn Cristophe and his expensive tastes. And his enthusiasm. Last night was the first time she’d let herself get really looped. Even at home, she wasn’t a big drinker, and with the constant threat of “some lunatic with a pocket full of roofies,” as her roommate Hannah warned, she was more likely to order one drink and nurse it, keep it close, than she was to indulge. But not last night. Last night had been a beer (only one), limoncello (dangerously delicious), and grappa (kill me now)-fueled blur. Simone—blonde, giggling Simone—had kept pace with Janine, Christophe, and the trio of Italian layabouts they’d picked up in Portofino and seemed none the worse for wear. Typical. Simone’s capacity had been campus legend at the small college they’d attended together. Ginormous linemen couldn’t keep up with her. Janine was a fool to have tried. But she was nearing the end of her trip, so she’d gone for it. Man, had that been a mistake. The departure date on her ticket—oh, God, the ticket!—was looming ever closer. She only had a few days left. Only a few days to indulge. Only a few days to soak in the culture she wouldn’t be able to afford to visit again for years. Only a few days to find her. Janine had saved the Isola del Sole until last. Not just because it was famous for its turquoise seas, its flowers, its history. But because she lived here. Stéphanie, her sister. Half sister, she mentally corrected. Half. They shared a charming father and nothing else. Janine hadn’t even known Stéphanie existed until the day her letter arrived. In all the years Janine had spent in the tidy suburban bungalow she shared with her family, she’d never really wondered about her biological father. She’d never missed out on love or attention, never wished he’d sweep her into a princess fantasy better suited to a Disney movie. Her mother never talked about him. Once Emily met Steve Pike, and Steve had fallen as hard for Janine as he had for her, that was it. Steve adopted Emily’s seven-year-old daughter the day of their courthouse wedding, and he was the only father Janine had ever needed. Wanted. The monogrammed envelope bearing the exotic foreign postmark had the same impact as a grenade. Stéphanie Harlen’s letter did what twenty years of questions hadn’t: pried open her mother’s secretive lips. The man who made her, the one who never called or wrote, wasn’t a wayward college student, a spoiled trust-fund brat, a long-haul trucker, or a regrettable one-night stand—scenarios Janine had conjured over the years in response to Emily’s silence. Nope. Her father was French. Famous. A household name, if you happened to adore food as much as you loved a legendary story. She still had a hard time believing that Valéry Harlen, the dashing bad boy chef whose Mange Bien! TV series made him a household name, was the man responsible for her temper and her tenacious cowlick. And probably the uncharacteristic urge that goaded her into quitting her first real job and flying to Europe on this trip. As far as Janine knew, keeping her surprise daughter was the only impulsive thing her organized, no-nonsense mother had ever done in her life. Linen Suit coughed pointedly and pulled out a silk handkerchief. Judging from the cut of his jacket and quality of the fabric, this man was no ordinary desk clerk. He was probably management, and probably beyond irritated at the irresponsible American with the wastrel friends. “I’m sure we can get this straightened out,” she finally stammered as he dabbed at the beads of sweat forming along his hairline. Nothing to be done. She had one card to play, and she hoped like hell Stéphanie Harlen wouldn’t resent her for playing it. She stood up and brushed the sand off the back of her shorts, located her shoes, and trudged up the beach behind him toward the cream stucco of the Hotel dei Fiori Isola del Sole. Strange how things came full circle whether you planned them or not, she thought as they crossed into the cool shade of the stone tunnel leading from the beach to the lush front gardens of the hotel property. Valéry Harlen’s career had been launched from this place, his passionate and creative approach to traditional French and Italian cuisine earning him fame in foodie circles and a river of lire to boot. His first cookbook swaggered to the top of the bestseller lists, and his Gallic good looks catapulted him out of the kitchen and onto television. The cookbook that followed, Riez Souvent, its title taken from the television show’s closing toast, sent him on a worldwide tour of destination food cities and probably the bedrooms of a slew of enchanted women. Or book publicists, in Emily’s case. The affair had lasted a week. The souvenir was currently 24, jobless, and regretting she’d trusted someone like Simone’s Eurotrash boyfriend with all of her possessions. They emerged into a sunlit garden ablaze in color and redolent with scent. Stately cypress trees encircled the space and gave it a cloistered feel despite being framed by the long curve of the hotel’s driveway. Roses bloomed in multicolored profusion. Bright geraniums poked their cheerful heads from planters and urns set along the walkways. Janine followed Linen Suit through the arch of blazing pink bougainvillea that marked the end of the garden and across a cobbled portico dotted with luxury cars. A quartet of smiling doormen swept open the massive carved doors to usher them into the lobby. She let out a low whistle at the opulence that greeted her everywhere she looked: silk sheers at the windows, embroidered pillows on the chairs, even gold leaf on the figured plaster ceiling. The hotel’s signature floral arrangements cascaded from urns, vases, and baskets, sending dizzying spirals of lush scent into the air. Jazz music sparkled from a grand piano tucked into the curve of the wide stairway to the second floor mezzanine. Janine hunched her shoulders, feeling conspicuous at how shabby and out of place she must look in her travel-worn shorts and fading shirt. All around her, impossibly chic, slim women glided by in crisp resort wear and expensive sandals. A harried porter pushed past her, toting a fortune in Louis Vuitton luggage. Janine thought ruefully of her now-missing backpack, its web of scars from being dropped, dragged, and shoved into compartments all over Europe. That backpack had been her home, really, for months now. It held everything—her few changes of clothes, the one cute dress she’d packed for slightly more formal occasions, a dried thistle from the Highlands of Scotland, a vintage scarf discovered at a flea market in Paris, flat pebbles she’d scooped out of the Rhine near the rock of the Lorelei, and a piece of millefiori she couldn’t resist buying for her mother in Rome. Not to mention her watertight pouch containing the rest of her cash, her bank and credit cards, and her passport. Geez, her passport. How in the world would she manage to replace that with no money and no other ID? Her American driver’s license was in the pouch with it. Linen Suit stepped behind the counter and spoke quietly with a woman holding a phone receiver. She glanced over at Janine, then handed a paper to Linen Suit. Janine looked over the bill and blanched at the total. “Will you be paying in cash or by credit card?” His bland face suggested that this amount was nothing special. She suppressed a cough. How had they managed to run up a tab that large? It had a comma in it, for Pete’s sake! “Credit.” He reached for a card reader. “I’m not—“ Her voice was louder than she expected. People were starting to whisper. She looked away from the counter toward the staircase. Her gaze collided with that of the man sitting behind the glossy grand piano. His dark eyes were steady, his sculptural face a smooth cappuccino brown. A charge rippled through her and dissipated just as quickly. He might be just a piano player, but even from this distance she could tell from the perfect tailoring of the jacket smoothed across his broad shoulders that he fit right in with the wealthy clientele of the lobby. Unlike her. “I’m afraid that might not be good enough,” he said. His blandly pleasant face had disappeared, replaced by one that telegraphed his disapproval. She’d never felt more like a stereotypical ugly American tourist, and she hadn’t done anything except have too much to drink the night before. She was tired, she was hung over, and she needed a shower. She was out of options. Shel Myerson ran his hand over his close-cropped scalp, marveling again at the smooth feel. It wasn’t the most original idea in the world, getting a haircut to symbolize a grand change in your life, but it still took getting used to. He had to admit that the new look really helped. Paparazzi the world over knew him from his signature dreadlocks and his height. Cameras were nothing new for Shel—you spent your life in front of one when your mother was a beloved 80s sitcom star—but he’d long since become bored of the photographers who followed him like gnats. Their persistence had only worsened when his own creative venture, the historical fantasy cult show Fortune’s Fool, became a worldwide phenomenon and catapulted him onto the Forbes list. After that, he couldn’t take a leak without one of the bastards following him into the can. Three years of nonstop meetings, press junkets, and negotiations. Three years of parties, beautiful women, good times. The past six months alone had been an adrenaline-fueled blur, and not just because he’d been shadowing his best friend Rocco De Luca during the spring’s F1 event calendar, taking notes for a new series idea in between stints behind the wheel at charity races. Writing and producing kept him busy and made him more money than he could spend in four lifetimes, but racing helped bleed off the energy that kept him up at nights, held the insomnia that had plagued him since he was a little boy at bay. He stretched his long legs beneath the burnished Fazioli grand he’d been playing, then began a new piece. Something light and American, something pleasant. Nothing that would draw much attention. Anonymity had its perks. Get a crotchety old barber in Lake Como to cut your hair. Take a public ferry back to the Isola del Sole instead of his usual helicopter from Sorrento. Throw on a suit, sit at the piano bench, and you become a ghost. Just an employee. Just part of the background. He looked around the opulent room. No one flicked a glance in his direction. Not the porters, not the front desk staff, and certainly not the women. He knew women like this. Hell, he usually dated women like this—polished, gorgeous, rich. The kind who spent more on sunglasses each year than most families did on groceries. They were like walking F1 cars: sleek, fast, and dangerous. He didn’t ask what kind of places she meant. During their tempestuous months together, he’d taken her to openings and events, galas and shows, sat front row during Fashion Week in both Paris and Milan marveling at her the way he was expected, and acted the perfect gentleman when she dumped him, yet again, in Venice. Considering they were both barely clothed at the time, he thought he’d done well not to have pushed her out on the balcony and let the swarm of lenses along the Grand Canal broadcast the news to the hungry world of gossip. 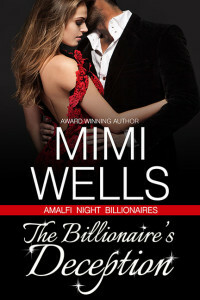 Instead, he’d paid for the suite, tipped the housekeepers an outrageous amount to atone for Pilar’s mountain of makeup-stained towels and the wrinkled designer clothes she’d strewn everywhere, and left their five-star luxury inn for the relative quiet of Rocco’s family’s flagship hotel on the Isola del Sole. Surprise number one was that Matteo, Rocco’s older brother and the manager of the dei Fiori hotel group wasn’t there. He’d gone to Venice to meet with Baroness Helena Von Lienz, a lovely and sophisticated ex-model, to negotiate, charm, or, if necessary, seduce her out of the ownership percentage in the dei Fiori hotels she’d inherited from her late husband. Surprise number two was that Rocco had scooped up Matteo’s briskly efficient assistant and whisked her off to England. But the staff knew him well from his many late night jaunts with Rocco. They ensconced him in a private cottage out back, the one in the corner closet to the staff apartments, for some quiet. He thought and wrote best in times of personal pressure. If this relationship implosion in front of the entire European gossip corps didn’t qualify as personal pressure, he didn’t know what would. “…I’m sure my friends will come back soon and settle everything.” Shel frowned. The conversation wasn’t going well. He looked closer. She was American, he could tell from her accent. Alone, obviously. But she carried nothing with her. No bag, no suitcase, nothing. “Signorina Harlen is not available,” Fusco said. 1) Obsessive fangirls of the show who propositioned him. 2) Gossip blog readers who propositioned him because he was famous and had hot actor friends. 3) Gold diggers who propositioned him because he was rich. Shel blinked in surprise. Steffi had never mentioned a sister. Ding! Ding! Ding! So that’s what Janine was hiding. This day, and Janine, were getting more fascinating by the minute. Fusco abandoned his tirade and his face shifted to rapt attention. Unlike Janine, he knew exactly who Shel was, including his relationship with the De Luca brothers. published by the Holiday Books imprint of Tule Publishing. Find out more here!